December 2013 – Damn, I Can Make That! 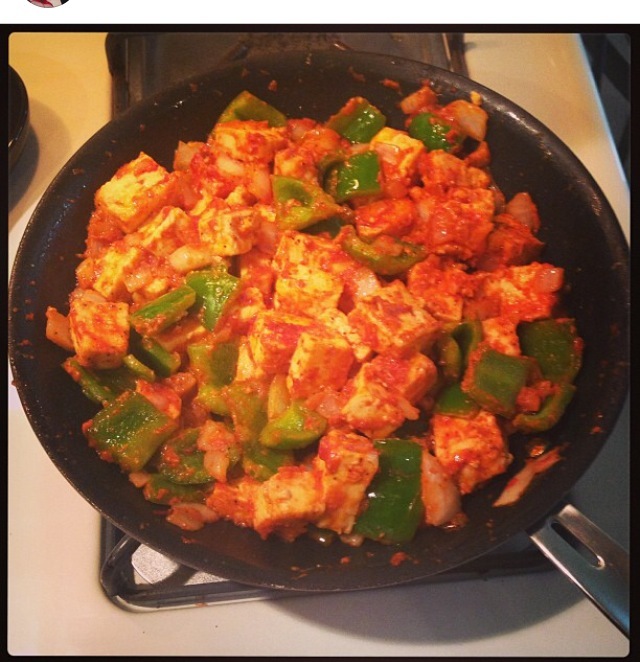 Merely translates to bell pepper paneer. If you don’t know what paneer is, google it. (Their explanation will be much better than my cliché response: its like “cottage” cheese). Point here is to reuse the lovely ingredients you purchased for the Goan Shrimp Curry recipe. Swap out the shrimp for paneer and the coconut milk for green bell peppers. Yes, its just that simple! Now, I will say there are many ways to prepare this dish, but this one is the easiest, as well as, my favorite. 2 chopped green bell peppers (keep the diced size similar to the size you cut the paneer so it all cooks well and evenly together. Also, Green is best in my opinion as red & yellow tend to have a sweeter flavor that would detract from this dish). 250 gm Paneer (Store bought paneer is fine, I know your moms probably make it from scratch, oh well. Dice into cubes). Create the tadka (remember that fun word we learned previously? No? Its just browning the spices in hot oil, 3 tablespoons of oil on high heat) then add tomato paste (note I use the paste vs. most people who use actual tomatoes. Feel free to use either, I just think real tomatoes have too high of a water content making the dish more wet & I prefer the sabzi to be dry), chopped onions and bell pepper. Once the tomato paste has melted and mixed in with the veggies add the cubed paneer. Cook stove top on medium heat for 15 minutes. Serve with rice or roti. So the best thing I have been hearing from people is that Jess and Sonia have the same voice. No one can differentiate who writes what post, because we have the same sense of humor, writing style, cooking/recipe style. Let me fill you in on a little secret, that was kind of the point & reasoning behind our fab collabo. Anyway, instead of keeping up the cryptic façade of who is writing this post, I will have to go ahead and spill the beans. Only because Jess is obsessed with all things TRUFFLE (you name it: fries, mac & cheese, mashed potatoes, popcorn-check out her recipe, it is DIVINE). Having said that, she has now gotten me on the truffle bandwagon. I, too, am now OBSESSED. So in honor of Jess and missing our last face time date, I wanted to share this recipe with y’all. •Kosher or Sea salt (something course). •1/2 cup heavy cream (I tried to lighten this up and did half & half, I mean can you blame a girl: butter, cheese, cream. It was getting a lil cray even for my fattie/foodie side). •3 ounces white truffle butter (should be about $7, I bought a 4 oz package for $7.99. Yes its expensive, yes its different, you tell us worth it or not. Also if you aren’t a fan of truffle butter or have skeptics coming to dinner perhaps use 2 oz. It’s a strong flavor so no one will hate you for cutting back, I stuck with 3 though because its “damn delish”). •3 ounces Parmesan (shaved thin with a vegetable peeler or be lazy like me and have them shave it at the cheese counter for you). Add 1 tablespoon salt to a large pot of water and bring to a boil & cook pasta. Meanwhile, in a large (12-inch) saute pan, heat the cream over medium heat until it comes to a simmer. Add the truffle butter, 1 teaspoon salt, and 1/2 teaspoon pepper. Lower the heat to very low, and swirl the butter until it melts. Keep warm over very low heat. When the pasta is cooked, reserve 1/2 cup of the cooking water, then drain & add the pasta immediately (you don’t want the starchy noodles to clump together sitting in a side bowl, not that it happened to me, ok gawsh). Add the drained pasta to the saute pan and toss it with the truffle-cream mixture. As the pasta absorbs the sauce, add as much of the reserved cooking water, as necessary, to keep the pasta very creamy. (I added like 3 tbsp. not even). 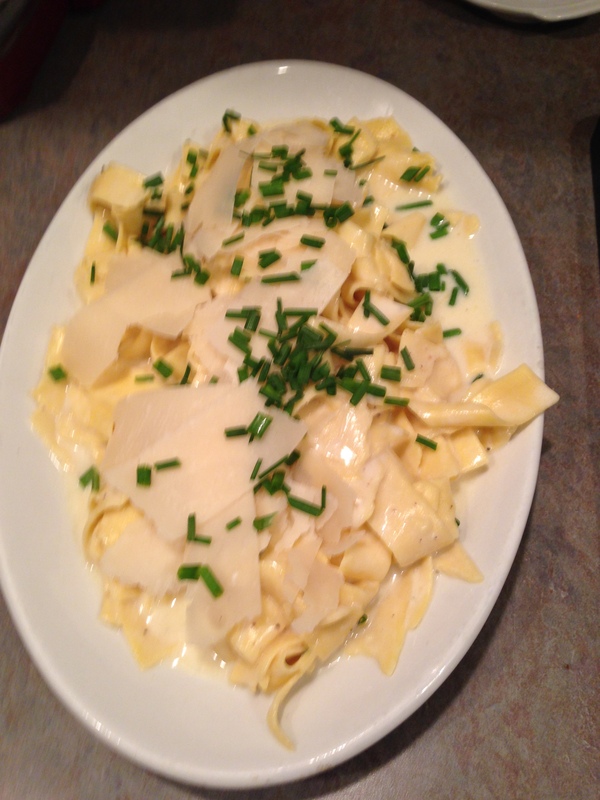 Serve the pasta & garnish each serving with a generous sprinkling of chives and shaved Parmesan. Serve immediately so the sauce doesn’t over-thicken. Also the original recipe says that this makes 2 portions, but let’s be honest here…this dish is DECADENT! So I’d say it is realistically a starter course or side dish for 4 servings. Yup that’s it, can’t believe how quick such a fancy dish can be? Well, make it and find out for yourself. Make sure to comment below on your thoughts! Or tweet at us with your opinion: #teamtruffle worth the $ or not. p.s. less than one month till the dynamic duo’s birthday. #justsaying. Warning: If you have a roommate or significant other around, you may want to make two batches so you don’t have to share! That being said, I give you the deliciousness that is truffle popcorn for your eating pleasure. You can make the popcorn the old fashioned way in a large covered pot/popcorn maker, or just do what I did and buy it in the microwavable bag. If you’re doing it the old fashioned way, pour in kernels and vegetable oil and wait for the popping. It should be done in about 6-ish minutes. Otherwise, microwave the bag according to its instructions. 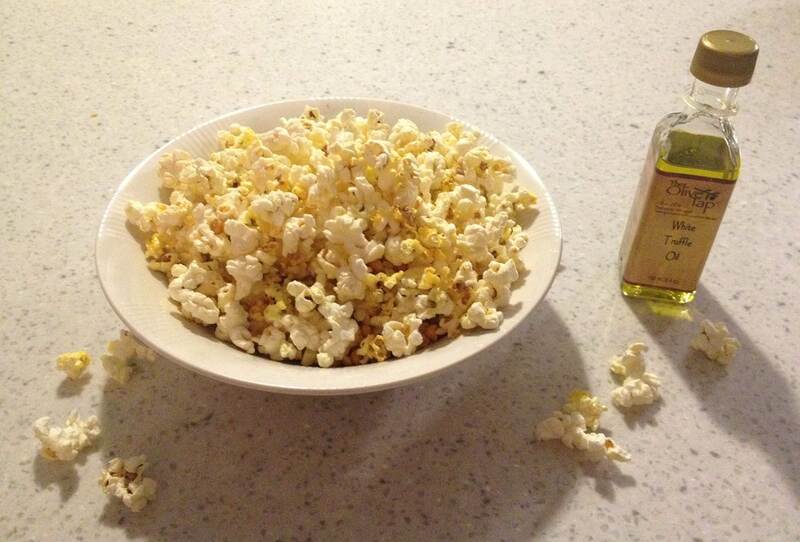 When finished, transfer it all to your popcorn bowl and thoroughly mix in the salt, truffle oil and butter. You can also check out our latest delicious recipe – truffle pasta! Mix all ingredients, other than the cheese, with whatever vehicle you are roasting. For example, when you roast the sprouts, I would slice them in half and then toss with the oil mixture. Roast at 350 degrees for 15-20 min, maybe turning once for even crisping. Lastly, when cooling out of the oven (right before serving), sprinkle the reggiano over the veggies. We are way too grown up to still be doing easy mac from our good ole friends at Kraft. As enjoyable as that was in college, its time to realize an orange powder may not be the best thing to put into our bodies. This is just as quick, but with fresh ingredients. Oh and speaking of watching what we put into our bodies, this recipe is figure friendly because there is no butter and no heavy cream. Just simple, clean, and tasty. 1 tsp Dijon mustard (umm so I did tablespoon not teaspoon because apparently I don’t know how to read and it was noticeably too tangy so don’t rush and read the measurements properly, lesson learned). 1 tsp parsley flakes (I just add this to almost any recipe I can because I think the little green flecks just brighten up a dish, in other words “optional”). Boil elbows. Drain pasta in colander while reserving 1/3 cup of the cooking liquid. 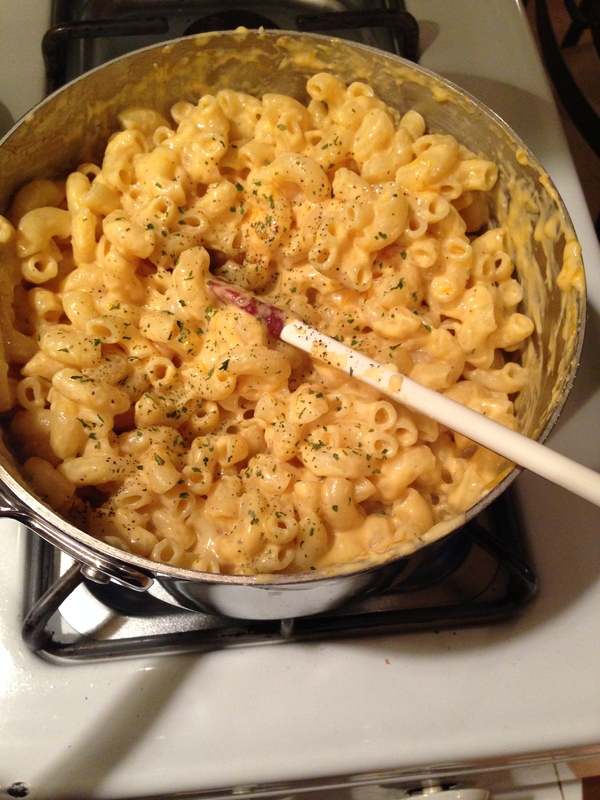 Return macaroni to pot and mix in the remaining ingredients over low heat (including the pasta water). Fold gently to melt and mix all ingredients. I may throw in some pancetta next time to add another element slash make it more entree worthy vs. side dish. Plus let’s face it, pancetta would make it the grown up version of the throwback, when mom’s across America cut up hot dogs for us when we were kids & threw it in our mac & cheese.